Syracuse lacrosse looks upfield. Mandatory Photo Credit: Initra Marilyn, The Juice Online. Syracuse’s inconsistency at the X proved to be a major factor in a 15-3 loss to Albany on Saturday afternoon at the Carrier Dome. It was Albany’s second win against Syracuse in program history. Albany won 17 of 22 faceoffs, as the Orange began rotating through faceoff specialists. Of the five wins at the X, three went to Dan Varello, one to Seth DeLisle, and one to Jared Fernandez. Meanwhile, Albany All-American TD Ierlan dominated, securing 16 of the 17 victories at the X. It was a different outcome from last year when he had trouble against Syracuse’s Ben Williams, only winning 6-of-21. Were there any positives from faceoffs? “It’s hard to think of any,” Syracuse head coach John Desko said. The extra possessions allowed Albany to seize rhythm and control while also wearing down Syracuse’s defense. Syracuse was only down 4-1 at halftime, but any comeback hopes were halted as Albany went on a 7-1 scoring run to take an 11-2 lead after the third quarter. Albany would score another four in the fourth, with Syracuse scoring just one. 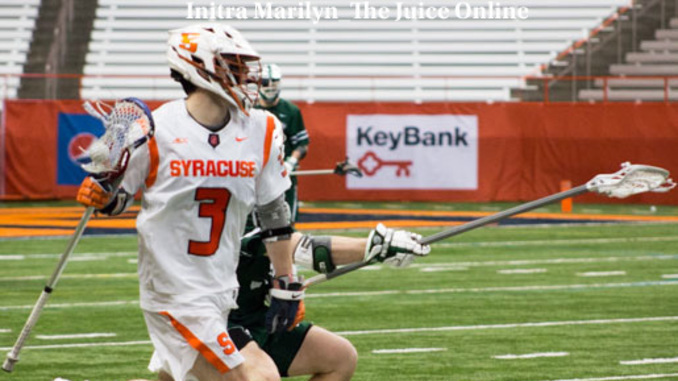 Trouble in transition marked Syracuse’s defensive inabilities to stop Albany’s penetration. Albany head coach Scott Marr highlighted last year’s outcome in how he structured his team’s game plan this year. As is typically the case, faceoff wins emulated offensive possession. The Orange only got 23 shots off as opposed to Albany’s 50. When Syracuse did have possession, it turned the ball over 14 times, and was held scoreless for nearly 36 minutes after Jamie Trimboli’s goal early in the first. Jenn is currently covering Syracuse basketball, lacrosse, and football. Jenn has interned for NBC Sports Boston, the official network of the Boston Celtics and is a senior at Syracuse studying advertising and marketing management. A native of Boston, Massachusetts, Jenn is an avid sports fan and looks to continue her dream of sports reporting and sports writing. Follow her on Twitter @jennnnncastro.